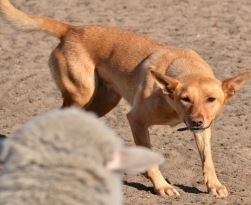 Sheepdog Training in Western Australia, training, clinics, lessons, dvds. Welcome to my website. My name is Nan Lloyd. I live in Beverley in Western Australia's Wheatbelt. 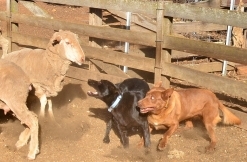 I breed, train and trial Kelpies. All my Kelpies are bred for utility farm work and all are registered with the Working Kelpie Council. I occasionally have puppies and started dogs for sale . However as I only breed the occasional litter, these are few and far between. I am available for sheepdog training lessons, and can do private lessons or small groups at my farm, or I can come to your place if preferred. Costs will vary depending on the distance I have to travel. I am very reasonable with my costs and am happy to work things out for the benifit of everyone. I am Certificate 1V in workplace training and assessment qualified. 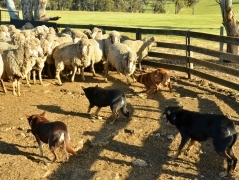 I have many years experience training and working dogs on farms. I have also been trialling for a long time, and my three main dogs have all won Yard, Utility and Arena trials. Check out some of my training and trialling articles, and dont hesitiate to email if you have any questions. For trial results, dates, info and happenings in the trialling world in Western Australia check out this website. Any training tips or articles are of a general nature only, and may not necessarily work in your situation. Please use your own discretion in applying the methods suggested. This site is an information source only. Any trainer, contact or property listed is not necessarily an endorsement. Nor does lack of inclusion of any trainer or establishment have any significance. Due to costs, I am no longer selling dog whistles. 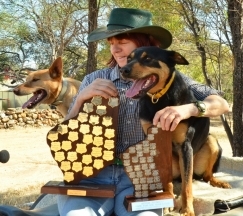 Last year, my young dog Kumbark Ace won the state open yard at Tarwonga. This qualified him as the state rep to compete in the National yard in West Wyalong NSW. This event willl be run in November so I am hopeing to make the trip, and also hope to compete in the National Kelpie Feild Trial at Carcoar. His mother, Barkervale Oswin also won the state open utility on the same weekend.